Prince’s track record also includes serving as an important financial contributor to the Republican Party, backing various conservative causes and rightist groups in the United States, and serving as an informal adviser to the crown prince of Abu Dhabi, where he has assisted efforts to train mercenary desert armies. Prince denied any connection to a project in Xinjiang and FSG took the announcement off its web site. But the incident struck a familiar chord for Prince’s critics, who had questioned his dealings with China. Xinjiang had appeared on FSG’s radar two years before, when the firm announced it would set up an office in the province. The Chinese government did not dispute the Chinese media reports that FSG was going to build the training facility, and it was Prince, speaking on his own behalf, who denied the reports. When Donald Trump’s plan to remove two thousand U.S. troops from Syria ran into strong, bipartisan opposition, Prince recommended that private mercenaries replace U.S. troops even though he did not seem familiar with the situation on the ground in Syria. “If there is not some kind of robust capability to defend from a ground invasions from the very conventional power that the Iranians and the Syrians have, our allies will be smashed,” Prince said. But the “allies” to which he referred were not primarily concerned with Syrian or Iranian forces. Their concern was with Turkey, who saw the resistance fighters as a threat because they were Kurds and had connections to Kurdish forces in Turkey. Indeed, Turkish president Recep Tayyip Erdogan had made it clear to Trump that he intended to strike at the Syrian Kurdish forces. Prince’s pitch to use mercenary forces in Syria followed a proposal for a similar deployment in Afghanistan. In July 2018, Prince proposed that small teams of armed private contractors would mentor Afghan troops—training them and accompanying them into combat—and aircraft flown by contractors with Afghan co-pilots would support them. These small teams would, Prince suggested, take the place of U.S. troops and even those of allies, at a fraction of the cost. Prince had first proposed the plan in 2017. He won the support of Steve Bannon, who was the key White House strategist at the time, and of Trump’s son-in-law, Jared Kushner. But then-Defense Secretary Jim Mattis and other officials opposed the idea and were able to block it. By July 2018, Mattis had fallen out of favor with Trump, who had been intrigued by Prince’s idea. Secretary of State Mike Pompeo, with whom Prince had discussed his proposal while he was still the head of the CIA, was also receptive to the idea. However, Pompeo reportedly considered that “Mr. Trump’s current strategy was working. The Taliban. … can no longer rely on waiting for US forces to pull out.” But soon after, talks between the U.S. and the Taliban intensified, and by the end of 2018, Trump had announced his intention to cut the number of U.S. troops in Afghanistan by half, contradicting Pompeo’s statement, and opening the possibility that Prince’s idea could still be part of a U.S. exit strategy. In May 2018, a report alleged that Prince was a key figure in putting together an August 2016 meeting between an Israeli expert in social media manipulation, a representative of key Arab monarchies in the Persian Gulf, and representatives of the Trump campaign. The allegations appeared to bolster accusations that the Trump campaign worked with agents of foreign powers to gain unfair advantage in the 2016 presidential election. Shortly before that, Prince was the subject of scrutiny for his alleged involvement in illicit talks with Russian representatives about establishing a back-channel between the Trump transition team and Moscow and because of his close ties to people associated with the Cambridge Analytica data-mining scandal. Prince also appears to have played a role in the scandal over ties between Russia and Donald Trump‘s presidential election campaign. The Times said that while it was not clear if the Trump campaign had ever executed the plan, Donald Trump, Jr. reacted positively to the proposal. In March 2018, Special Prosecutor Robert Mueller began scrutinizing the Seychelles meeting more closely and gained the cooperation of another attendee of that meeting, George Nader. Prince had testified to Congress that the meeting was not intended to set up a back-channel communication network between the Trump team and Moscow, but that he was in the Seychelles on business and had an impromptu “sit-down” with the Putin ally. This testimony raised the possibility that Mueller was investigating whether Prince had perjured himself. The subsequent revelations appear to have strengthened that possibility. Nader was reportedly cooperating with the investigation of Special Counsel Robert Mueller, leading to the conclusion that the new revelations were particularly vexing to Trump. Prince’s activities in support of Trump and, particularly, in connecting the UAE and other Gulf states with the Trump administration, dovetail with his effort to capitalize on the trend toward privatizing military endeavors since Trump’s election. In 2016, a group of Frontier executives and directors resigned over concerns that the corporation was engaged in potential violations of U.S. law by facilitating the sale of military planes to Azerbaijan. The matter was, investigated by the State Department, but the sale was cancelled when Frontier received a report that indicated that those involved could be prosecuted. While it is unclear whether Prince violated U.S. law, his involvement has caused discomfort among colleagues and critics in the United States. It has raised significant questions of whether he is actively working against U.S. interests. Business was initially slow, but the 2000 attack on the U.S.S. Cole “led the Navy to look for someone to train sailors to identify and respond to terrorist threats. Blackwater won a contract. But business really soared after the Sept. 11, 2001, attacks—from about $200,000 in federal contracts in 2000 to $25 million in 2003 to nearly $600 million” in 2006. By late 2007, Blackwater had received $1 billion in federal contracts. The U.S. government outsourced jobs previously done by the army, and Blackwater began taking on contracts to protect diplomats in Iraq, among other things. 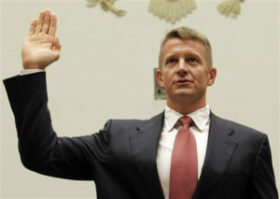 The move came about just as new allegations emerged regarding purported sanctions violations by Blackwater and Prince. McClatchy Newspapers reported in June 2010 that Prince had been seeking out new business in East Africa, specifically defense contracts in southern Sudan while Sudan was under U.S. economic sanctions. Prince was born into a prominent conservative family in Michigan. He served as an intern in 1992 in the White House of President George H.W. Bush and, later for Gary Bauer’s Family Research Council, an influential Religious Right organization that his father, Edgar Prince, helped found. In 1990, Prince worked at Rep. Dana Rohrabacher’s (R-CA) office, where he met and worked with future Blackwater lobbyist Paul Behrends. Prince, who converted to Roman Catholicism from the Calvinist Dutch Reform Church in 1992, has supported rightist Christian groups via the Edgar and Elsa Prince Foundation, where he has served as vice president. In fiscal 2006, the nonprofit foundation contributed nearly $8 million in grants to predominantly, if not exclusively, socially conservative groups, including $510,000 to the Family Research Council; $500,000 to the international proselytizing group the Haggai Institute; $1,000,000 to the Alliance Defense Fund; and more than $1 million to the Christian Calvin College in Michigan. Prince’s own nonprofit, the Freiheit Foundation, which he ran with his first wife Joan, funded a smaller but similar roster of conservative groups, including the Acton Institute, the Education Freedom Fund (where Prince’s sister, Betsy DeVos, has been a board member), and Christian Freedom International. In 2000, Prince’s Freiheit Foundation gave $500,000 to Prison Fellowship Ministries, a group that was once led by the notorious Nixon official Charles Colson, and contributed $30,000 to the American Enterprise Institute. The FreiheitFoundation appears to have stopped operating after Joan’s death in 2003. Prince’s family—including his late father Edgar, mother Elsa, and sister Betsy—has been deeply involved in conservative politics. Edgar, who founded the family automotive business, was a major backer of right-wing political and Christian groups, and was eulogized by Gary Bauer, who referred to him as his “mentor.” Betsy married into a powerful Michigan Republican Party family, the DeVoses, and Elsa (now Elsa Prince Broekhuizen after remarrying) has served on the boards of right-wing groups including the Family Research Council and Focus on the Family. The Prince family also has strong ties to the Council for National Policy, a secretive right-wing nationalist group whose membership has included a number of high-profile conservatives, including Gary Bauer, Jeffrey Bell, Edwin Feulner, Jack Kemp, Edwin Meese, Tommy Thompson, and Paul Weyrich. Edgar Prince was a longtime board member; Prince Broekhuizen served as president for several years; and Erik Prince’s Freiheit Foundation donated money to the group. Jim Schaefer, M.L. Elrick And Todd Spangler, “Ready for Battle,” Detroit Free Press, October 7, 2007. Dana Milbank, “The Man from Blackwater, Shooting from the Lip,” Washington Post, October 3, 2007, p. A2. Charlie Rose, “A Conversation with the CEO and Chairman of Blackwater, Erik Prince,” Charlie Rose Show, October 15, 2007. Ali Gharib, “Blackwater: The Real “Vast Right-Wing Conspiracy”? Right Web, July 18, 2008, http://rightweb.irc-online.org/rw/4934.html . Matt Apuzzo and Mike Baker, “Blackwater Plans Shift from Security Business,” Associated Press, July 21, 2008. Eric Prince, “How Blackwater Serves America,” Wall Street Journal, December 16, 2008. August Cole, “Founder, CEO of Blackwater Steps Aside, ‘Worn Out’,” Wall Street Journal, March 2, 2010. Jeremy Scahill, “The Nation: Blackwater For Sale,” National Public Radio, June 9, 2010, http://www.npr.org/templates/story/story.php?storyId=127589029. Jeremy Scahill, “Eric Prince Says His Enemies are al Qaeda, Taliban and ‘Noisy Leftists,’” Jeremy Scahill’s Blog, The Nation, May 6, 2010, http://www.thenation.com/blog/erik-prince-says-his-enemies-are-al-qaeda-taliban-and-noisy-leftists. Mark Mazzetti and Emily Hager, “Secret Desert Force Set Up by Blackwater’s Founder,” New York Times, May 14, 2011. Warren P. Strobel, Jonathan S. Landay, Joseph Neff, “Blackwater ignored sanctions in Sudan,” McClatchy Newspapers, June 27, 2010, http://www.charlotteobserver.com/2010/06/27/1528008/blackwater-ignored-sanctions-in.html. Jeremy Scahill, “Secret Erik Prince Tape Exposed,” The Nation, May 3, 2010, http://www.thenation.com/blog/secret-erik-prince-tape-exposed. Mark Mazzetti and Eric Schmitt, “Private Army Formed to Fight Somali Pirates Leaves Troubled Legacy,” New York Times, http://www.nytimes.com/2012/10/05/world/africa/private-army-leaves-troubled-legacy-in-somalia.html?pagewanted=all&_r=0. Jeremy Scahill, Blackwater: The Rise of the World’s Most Powerful Mercenary Army (New York: Nation Books, 2007), p. 148. Ben Van Heuvelen, “The Bush Administration’s Ties to Blackwater,” Salon.com, October 2, 2007. Grand Rapids Independent Media, “Holland’s Edgar and Elsa Prince Foundation Major Local and National Supporter of the Religious Right,” Grand Rapids Independent Media, Media Mouse,http://www.mediamouse.org/features/022707holla.php. 2000 IRS Form 990-PF for the Freiheit Foundation. Robert Weitzel, “US Military’s Middle East Crusade for Christ,” CommonDreams.org, June 9, 2008. Sue O’Connell, “The Money behind the Marriage Amendments,” Institute on Money in State Politics, January 27, 2006. See, for example, Ali Gharib, “Blackwater: The Real “Vast Right-Wing Conspiracy”? Right Web, July 18, 2008, https://rightweb.irc-online.org/rw/4934.html; see also, Mike Baker, “Blackwater dumps tarnished brand name,” Associated Press, February 13, 2009. Eli Lake, “Court Docs Reveal Blackwater’s Secret CIA Past,” Daily Beast, March 14, 2013, http://www.thedailybeast.com/articles/2013/03/14/exclusive-erik-prince-on-blackwater-s-secret-cia-past.html. Hunter Walker, “Five Things Blackwater’s Founder Thinks The World Got Wrong About His Company,” Talking Points Memo, December 5, 2013, http://talkingpointsmemo.com/news/five-things-blackwater-s-founder-thinks-the-world-got-wrong-about-his-company. Drake Bennett, “What Blackwater Founder Erik Prince Learned About the Business of War,” Bloomberg Businessweek, November 21, 2013, http://www.businessweek.com/printer/articles/169418-what-blackwater-founder-erik-prince-learned-about-the-business-of-war. Hunter Walker, “Blackwater Founder Says He ‘Didn’t Make A Whole Lot Of Money,'” Talking Points Memo,” December 17, 2013, http://talkingpointsmemo.com/news/erik-prince-says-he-didnt-make-a-whole-lot-of-money-with-blackwater. Ali Gharib, “Blackwater: The Real “Vast Right-Wing Conspiracy”? Right Web, July 18, 2008, https://rightweb.irc-online.org/rw/4934.html. Grand Rapids Independent Media, “Holland’s Edgar and Elsa Prince Foundation Major Local and National Supporter of the Religious Right,” Grand Rapids Independent Media, Media Mouse, http://www.mediamouse.org/features/022707holla.php.